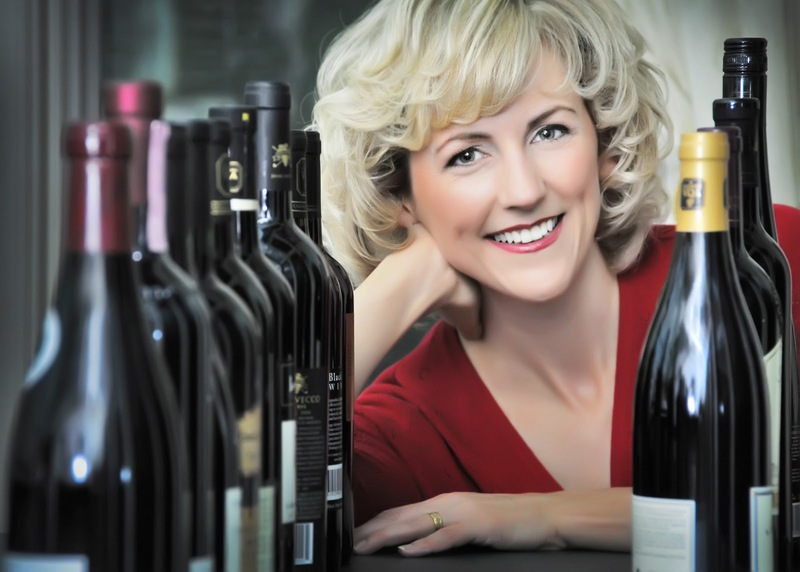 Wines for the Top 10 Tough-To-Buy-For People on Your Holiday List! Planning on giving the gift of wine this Holiday Season? 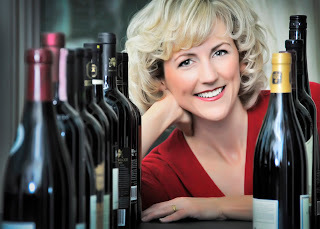 Then check out this helpful list from Natalie MacLean, wine expert and e-sommelier of the eponymous wine website www.nataliemaclean.com and author of the informative and extremely entertaining "Red, White and Drunk all Over: A Wine Soaked Journey from Grape to Glass," one of my favorite wine reads of all time! 1. Hairdresser: For the person who combines humor and optimism every time she styles your mop. Go for a light, gulpable wine like a dry rosé. It’s versatile and fuss-free—a great quaff for your coif. 2. Psychiatrist: Of course, he’ll analyze whatever you give him so choose a wine that’s all about balance. Easy-drinking pinot noir is medium-bodied yet packed with flavor. Surprise him with a large-format bottle, like a magnum. Big thinking means big progress for you. This wine also works for psychologists, marriage counselors and bartenders. And after all that shopping, don’t forget yourself: even Santa’s little helpers need more than milk and cookies. Try something with high-alcohol like Italian Amarone or Rhone syrah: these big reds easily drown out tone-deaf caroling and pair beautifully with tired feet. 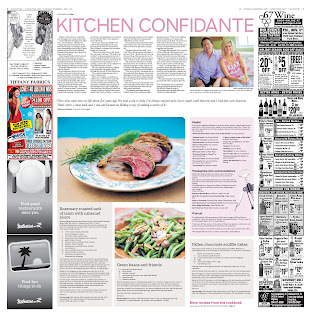 Great advice, Natalie, thanks so much for sharing - Cheers! I originally posted this entry last year right after Thanksgiving. It is such a delicious recipe and was so well-received I just had to post it again. It is the perfect dish to enjoy once you are "over" your leftovers. I hope you enjoy it! With its flavors of lemon cream, peaches and dried apricots the wine was a perfect pairing for the sea bass. Masi specializes in the production of Amarones and Reciotos, using the aforementioned historic technique of "appassimento" (drying of the grapes). Masi rediscovered and refined the technique of double fermentation using semi-dried grapes, and markets successful wines such as Campofiorin, its special selection Brolo di Campofiorin, Valpolicella dell'Anniversario Serego Alighieri and Passo Doble, produced in Argentina. Hope you enjoy this delicious post-Thanksgiving pairing! Need a Delicious, Make Ahead Thanksgiving Dessert? Try this Pumpkin Pie Trifle! Aaaaahh, Pumpkin Pie Season is finally here! No doubt this time of year there is ample opportunity to get your fill of it, perhaps even to the point where it becomes, dare I say, passé?! If you find yourself in this enviable position or you're just in the mood to try something new, you should give this delicious alternative a try. 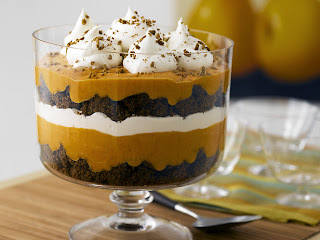 I made this Pumpkin Pie Trifle a few years ago and my family never even noticed the pumpkin pie was missing - it is THAT good! I am a big fan of trifles since you can make them the day before your big event and the flavors and texture only improve overnight in the fridge. They also travel remarkably well if you are bringing one to a lucky friend or relative's house. A trifle is a dessert dish made from thick custard, fruit, sponge cake, fruit juice or gelatin, and whipped cream. Research indicates it evolved from a similar dessert known as a fool or foole, and originally the two names were used interchangeably. The ingredients are usually arranged in layers with fruit and sponge on the bottom, and custard and cream on top. 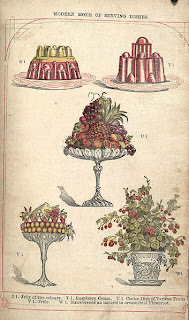 According to Wikipedia, the earliest known use of the name trifle was for a thick cream flavoured with sugar, ginger and rosewater, the recipe for which was published in England, 1596, in a book called "The good huswife's Jewell" by Thomas Dawson. It wasn't until sixty years later when milk was added and the custard was poured over alcohol soaked bread. While some people consider the inclusion of gelatin to be a recent variation, the earliest known recipe to include jelly dates from 1747, and the poet Oliver Wendell Holmes wrote of trifles containing jelly in 1861. 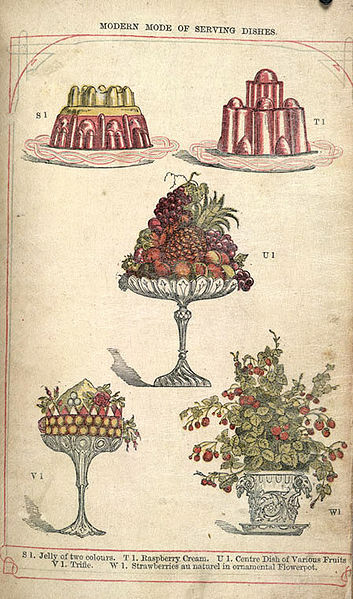 Some trifles contain a small amount of alcohol such as port, or, most commonly, sweet sherry or madeira wine. Non-alcoholic versions may use sweet juices or soft drinks such as ginger ale instead, as the liquid is necessary to moisten the cake layers. If you are in the market for a trifle bowl, the Miranda Trifle Bowl is available at Crate and Barrel and is a great basic to have, but there are plenty of options available depending on where you like to shop. I hope you enjoy this recipe and if you are looking to kick it up a notch with a wine pairing, a Late Harvest Gewürztraminer or Ice Wine would work very nicely. Cheers and I hope you have a very Happy Thanksgiving! Bake the pumpkin bread according to the package directions and cool completely. Meanwhile, prepare the pudding and set aside to cool. Stir the canned pumpkin, brown sugar, and spices into the pudding. Cube 1 batch of the pumpkin bread and arrange in the bottom of a trifle bowl. Depending on the size of your bowl, you may have some leftover. Pour 1/2 of the pudding mixture over the pumpkin bread, then add a layer of whipped topping. Repeat with the remaining pumpkin bread, pudding, and whipped topping. If preparing the day before, simply cover with plastic wrap and refrigerate overnight. Once ready to serve, sprinkle the top with the crushed gingersnaps. Enjoy! 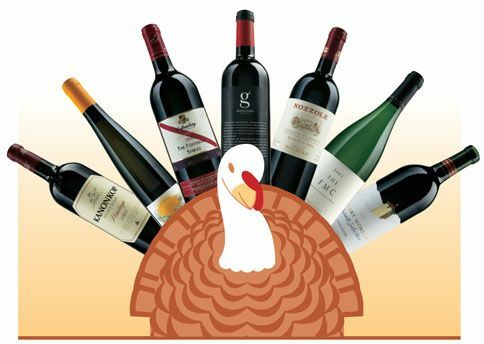 Wine Pairing Principles for Thanksgiving and Beyond! Holidays like Thanksgiving can sometimes cause an acute case of WPP otherwise known as wine pairing paralysis. With the cacophony of flavors and textures involved in a meal whose primary goal is to stuff oneself until bursting, what wine could possibly (1) complement the meal (2) appeal to a variety of palates and (3) not break the bank? Don’t fret, my fellow wine lovers, here are a few tips to help make the process a little easier for Thanksgiving or any other holiday meal. 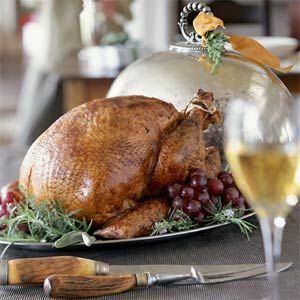 When presented with dishes such as roasted turkey, caramelized onion and cornbread stuffing, cranberry compote, sweet potato casserole and Brussels sprouts at the same meal, the best wines to select (and guests too I might add) are those that “play nicely with others.” Choose wines that are fruit-forward with a food-friendly acidity that will not only stimulate your taste buds but “do no harm” to your already flavor filled meal. Hold off on tannic Cabernet Sauvignons or heavily oaked Chardonnays and opt instead for lighter style Rieslings, unoaked Chardonnay, Pinot Noir and Merlot. The same principles apply when trying to satisfy a variety of palates at your holiday gathering. Avoiding wines with harsh tannins and heavy oak influence is usually a good game plan. 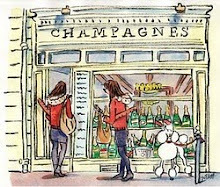 Select a fruity, approachable Cru Beaujolais or crisp, bubbly Spanish Cava to appease your guests. While universally appealing, these wines will also complement the flavors in your meal beautifully. Use the above principles to eliminate your wine pairing paralysis and get you through any holiday meal in style. Here are a few recommendations to get you started – Cheers and have a fabulous Thanksgiving Holiday! 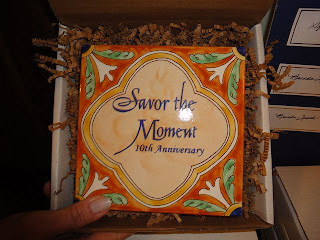 The Savor the Moment 10th Anniversary Celebration: Definitely "A Night to Remember!" In addition to plenty of fabulous food and wine, the evening also featured an amazing raffle chock full of specialty lots tailored for food and wine lovers. From Private Chef's services to Waterford crystal to a Chef's table dinner with wine pairings - tickets sold like hotcakes! Our raffle donors included 32 East, Art Sea Living, Bloomingdale's, Boca Bacchanal, Boca Bons, The Boca Raton Resort & Club, Brewzzi, Brooke Qualk, Caffe Luna Rosa, City Oyster, Cut 432, Café Boulud, Frederic Fekkai, John Paul Custom Cuisine, The Melting Pot, Neiman Marcus, Sigrid Olsen, Seasons 52, Southern Wine & Spirits, Stephanie Savors the Moment, The Sundy Houe, Taboo, Waterford Crystal and Where the Fairytale Begins. Their generous donations allowed us to raise a nice sum of money that will benefit our local community projects. Many thanks to our event Sponsors CDS International Holdings, the Seagate Beach Club, Worthing Place and Paul & Kathy Adkins for making the evening such a success! Big thanks too, to Brenda Lusher and her company Mizner Industries for creating the beautiful "Savor the Moment" 10th Anniversary commemorative tiles for the event. 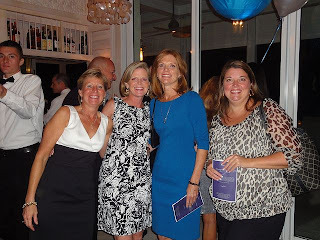 Also, our celebration could not have been possible without the AMAZING managers at the Seagate Beach Club, Cathy McNellen and Frank Forlini as well as an entire staff of truly wonderful people. They made the entire process, from planning to our incredible evening, a delightful experience! 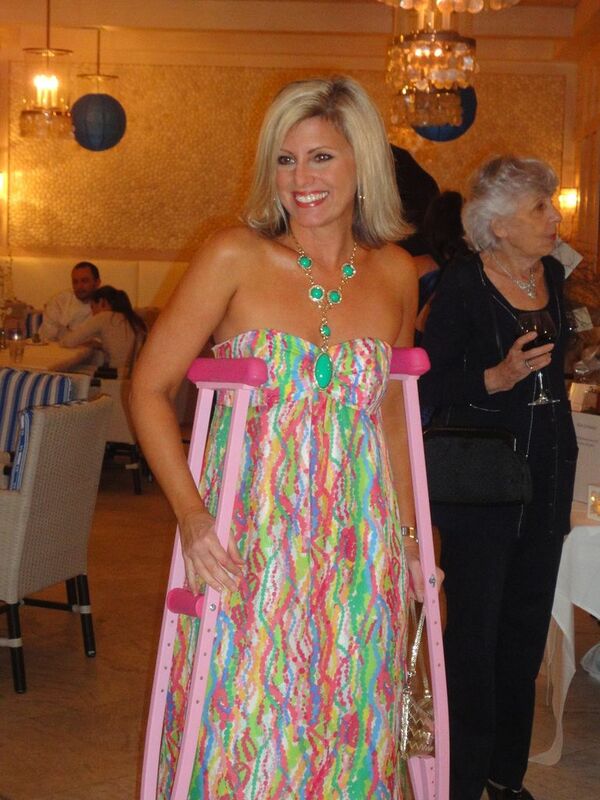 The only unfortunate thing to report about the evening was that, after breaking a bone in my leg two weeks prior, I was on crutches - ugh! Thankfully, my husband was nice enough to paint my crutches pink to coordinate with my Lilly Pulitzer dress - thanks, Hon! 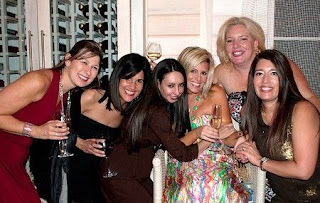 All in all though, it was a fabulous evening with friends full of moments to savor! 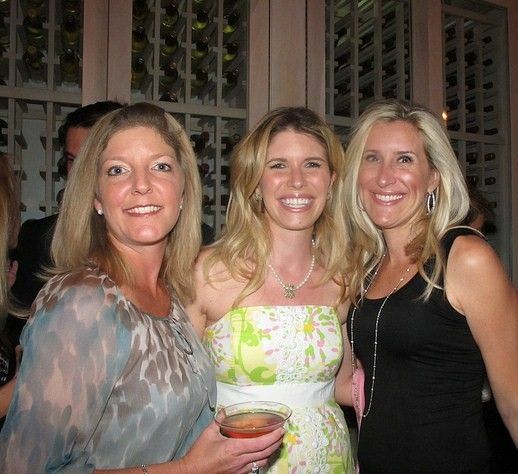 Be sure to check out the slideshow on the right side of this page for even more fun photos from the event. As for my blog, I will continue to wrap up the recipes in the "Savor the Moment" until the end of the year - stay tuned for some exciting announcements about what's to come in 2011! 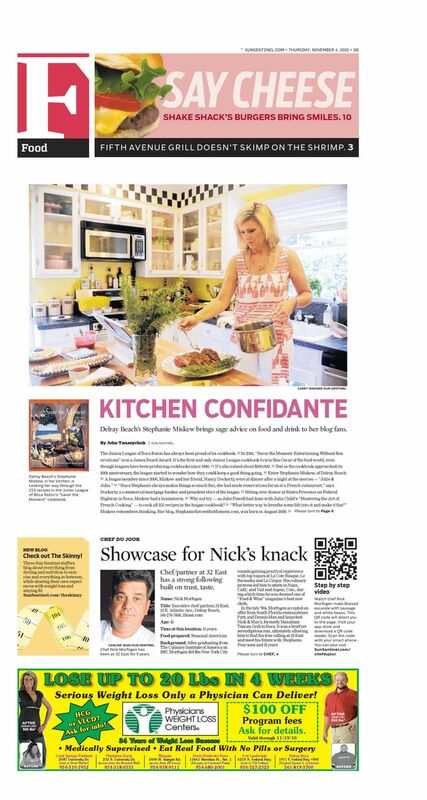 "Stephanie Savors the Moment" Featured in the Sun Sentinel! 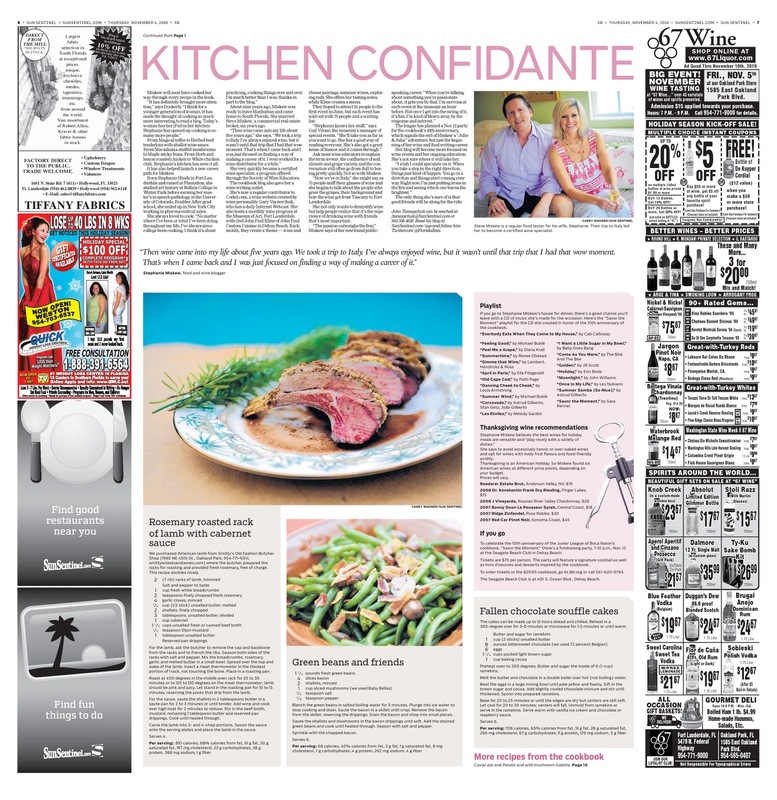 I am excited to report, last Thursday's Food Section in the South Florida Sun Sentinel featured an article about my blog, Stephanie Savors the Moment! The piece chronicled the inspiration behind and journey of writing the blog and cooking my way through "Savor the Moment" over the past year, à la Julie & Julia, and the interesting opportunities that have come about as a result. 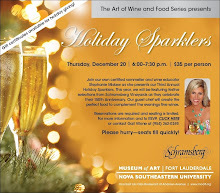 From writing for Cork'd to The Art of Wine & Food Tasting Series at The Museum of Art Fort Lauderdale it has certainly been quite an adventure! 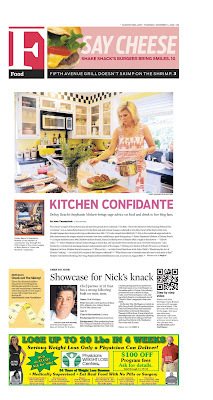 I was also humbled and honored to be featured on the cover with one of my favorite Chefs and culinary idols, Nick Morfogen, no less. It was a pleasure speaking with John Tanasychuk, Sun Sentinel Restaurant Critic and Food Aficionado, who conducted the interview at Chez Miskew last month. 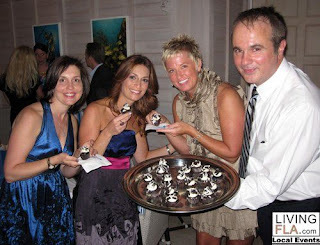 For the photo shoot, I prepared four favorite dishes from "Savor the Moment" including the Caviar Pie, Rosemary Roasted Rack of Lamb with Cabernet Sauce, Green Beans and Friends and Fallen Chocolate Souffle Cakes. You can't go wrong with these recipes for entertaining this holiday season! In addition to the recipes and a fabulous photo of my husband Steve (thanks, Hon! ), the article also includes wine recommendations for the Thanksgiving holiday and the "Savor the Moment 2010" playlist which is also available as an iMix on iTunes for your listening pleasure. The timing of the article also couldn't be better with our "Savor the Moment" 10th Anniversary Celebration taking place tomorrow, Friday, November 12th at the Seagate Beach Club. 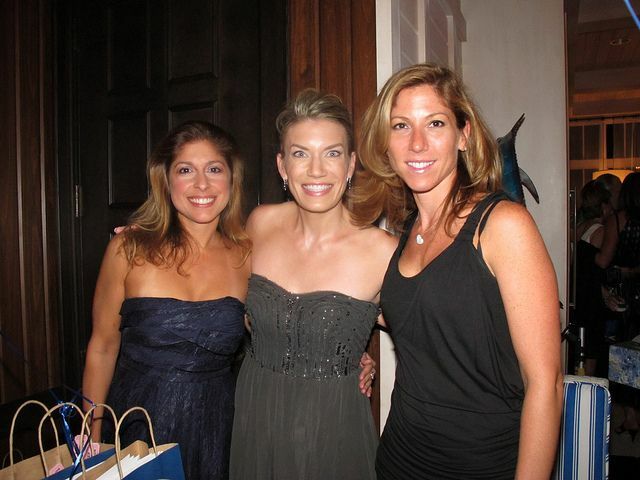 The Committee has been hard at work and we are all looking forward to "A Night to Remember!" Please check out the article and a huge thank you to everyone who has followed my blog over the past year. I am extremely grateful for your support and look forward to lots more food and wine fun in the future. Savor Soup Season with "Savor the Moment's" Mushroom and Tomato Soup with Vermouth! Don't you just love Fall? The glorious chill in the air, wearing your favorite cashmere sweater for the first time in months, not to mention the mouth-watering culinary implications. For me, soup becomes a top priority, and apparently I'm in some very good company! After taking a little Stephanie Savors the Moment Facebook poll, it appears there are plenty of you who also share a passion for soup, with preferences ranging from Carrot Soup with Star Anise to Julia Child's Santa Barbara Fish Soup, to "Plain Old" Chicken and Vegetable - definitely my kind of crowd! After a few weeks of cooking through the "Bread & Breakfasts" Chapter in "Savor the Moment," I am happy to be moving onto "Soups, Salads & Sandwiches" and the timing couldn't be better! I am happy to share with you the recipe for Mushroom and Tomato Soup with Vermouth (pg. 116), a deliciously creamy soup that is sure to warm you up on a chilly, Fall day. In addition to other delicious ingredients, this recipe calls for bouquet garni. "Bouquet garni" is French for "garnished bouquet" and refers to a bundle of herbs either tied together with string or enclosed in a sachet that is used to flavor soup, stock, and various stews. The bouquet is boiled with the other ingredients, then removed prior to serving. While the herbs included can vary, the one for this recipe call for fresh parsley, thyme, oregano, basil and bay leaf. In addition to the bouquet garni, fabulous flavor is derived from leeks, garlic, watercress and vermouth, along with great earthiness and texture from the mushrooms. The alcohol in the vermouth is eliminated during the cooking process so don't worry about getting tipsy from eating it! Otherwise, the recipe itself is pretty straightforward; however, I would advise you to be sure and hold on to the top of the blender cover while processing the hot soup or, better yet, remove the center portion of the lid and cover it with a dish towel to keep it from ending up all over your kitchen. As with most soups, the finished product gets better and better the longer it sits, although this soup it so good it probably won't last too long. I hope you enjoy this recipe and please check out the Stephanie Savors the Moment Facebook Page and give it a "like" to take part in some fun food and wine discussions! Saute the celery, leek ad garlic in the heated oil in a heavy large saucepan over medium-low heat for 7 minutes or until tender. Increase the hear to high and add the chopped mushrooms. Saute for 5 minutes or until light brown. Add the tomatoes, Chicken stock, cream, vermouth, tomato paste, sugar and bouquet garni. Season with salt and pepper. Bring to a boil and reduce the heat. Simmer, covered, for 30 minutes or until the vegetables are tender. Discard the bouquet garni. Process the soup in a blender until smooth. Pour into the saucepan. Saute the sliced mushrooms in the butter in a small skillet over medium heat for 5 minutes or until tender. Stir into the soup. Stir in the watercress and adjust the seasonings. Cook until heated through. Ladle into soup bowls and garnish with chopped chives. Note: The bouquet garni for this recipe is made of 2 parsley sprigs, 1 thyme sprig, 1 oregano sprig, 1 basil sprig, and 1 bay leaf tied in a cheesecloth bag.